Everything looks quite normal in this image until you look just temporal (or to the right) of the macula. The macula is the dark central spot in the photograph, and is typically a solid dark pigmentation, surrounded by evenly pigmented darker retinal tissue. As you move from the macula to the right, you can see an area of lighter, reflective tissue. 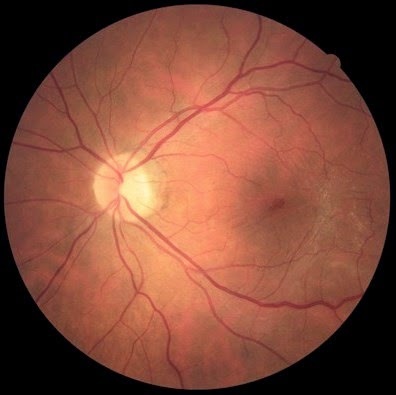 If you look very closely, you can even see small linear changes to the retinal tissue around this lighter area, that look like stretching or pulling. This area is an epiretinal membrane. Membranes in the back of the eye are quite common -- present in about 6% of the population over age 40. An epiretinal membrane is a proliferation (excess growth) of cells in the internal limiting membrane of the retinal tissue. They are typically idiopathic in presentation, but can be associated with ocular disease or posterior vitreal detachment. The cells that are growing in these membranes are normal cells that grow inside the eye -- retinal glial cells and retinal pigmented epithelium are the two most common cell types in a membrane. These cells are typically relegated to their specific retinal layers, but in epiretinal membrane formation these cells enter a new layer and start growing unchecked. We don't know why these membranes grow in some people, but current scientific theory suggests that these cells begin to proliferate when there is a disruption in the interface between the retinal tissue and the vitreous that fills the eye, either due to floater formation or retinal injury. With today's technology, membranes are easy to spot because they cause a shiny reflective area in a retinal photograph or when viewed by your doctor inside the eye. If you have a membrane, you may or may not experience vision changes. Membranes can cause symptoms that range from blurry vision to various vision distortions, or they may not have any visual side effect at all. In the patient above, vision was a perfect 20/20 and they reported no visual distortion in daily life or on Amsler Grid testing. 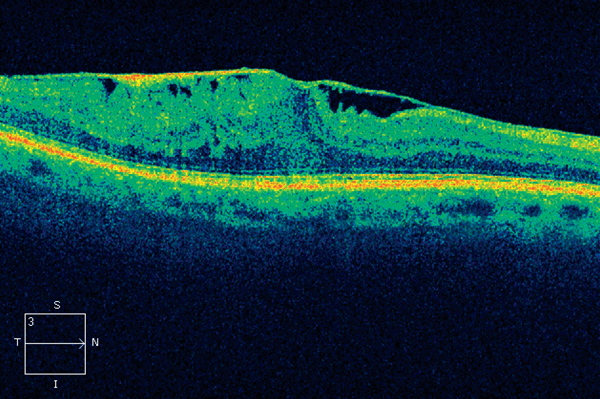 The good news -- most epiretinal membranes require no treatment other than observation. Your doctor will likely recommend OCT imaging to find any fluid under the macula or an impending r macular hole that could pose a bigger risk to vision. Many membranes either resolve on their own, or stay stable with time. If vision is significantly reduced (20/50 or worse as a general rule of thumb), your doctor may refer you to a retinal specialist for a procedure called a membrane peel. 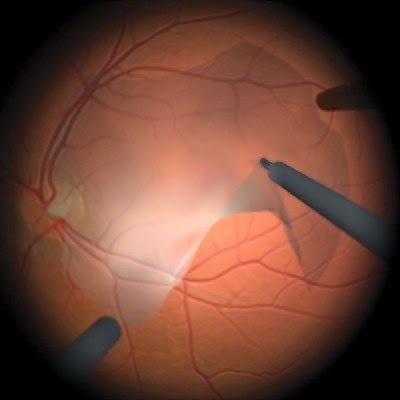 Membrane peels are not to be undertaken lightly -- there is a risk of retinal detachment with any retinal surgery. But if vision is compromised too much due to the membrane, typical visual outcome after a membrane peel is a gain of 2 or 3 Snellen lines of acuity. An alternative to epiretinal membrane peel is injection of Jetrea, but potential side effects are also present with injection of this medication.